Maine Sea Duck Hunting | Maine Sea Duck Hunting with Eiders Down, Inc. 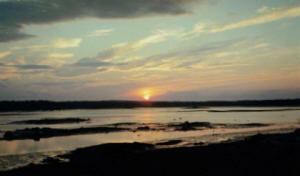 The Downeast Maine coast can be calm and peaceful, but the weather changes quickly. 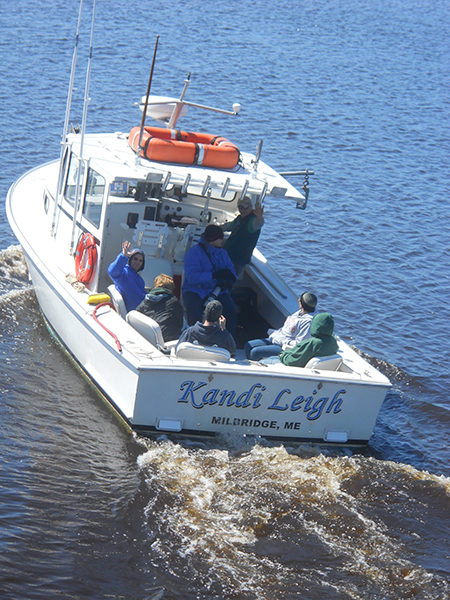 Whether it’s October or January, you’ll appreciate getting to these remote destinations swiftly, comfortably, and safely in our 28’ diesel-powered boat, Kandi Leigh. 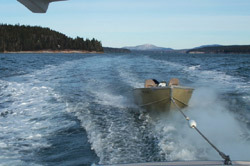 Heated and with full electronics, the big boat gives Eiders Down guides an advantage over using smaller boats alone. Stored on deck during the trip are the 50 decoys you’ll hunt over – all hand hewn by your Eiders Down guides. 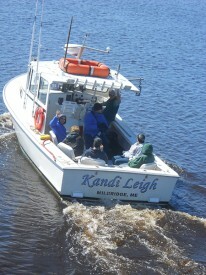 Behind us, we tow one of our 18’ Lund Alaskans. Rugged and seaworthy, they allow shore access from the big boat in nearly all conditions. While rare, there are days when weather and sea conditions prevent hunting. It is our firm policy to not refund the day’s fee in such instances, and we hope you agree that it is a small price to pay for your safety and well-being. During your hunt, we will introduce you to a unique and unforgettable place that is serenely beautiful and bitterly harsh – enlightening and humbling – timeless and ever-changing…where rafts of Eiders share the waters with solitary loons, and noble eagles must compete with lowly seagulls for the same meal. Wildlife is plentiful here, and in addition to our primary game ducks you may also see Bufflehead, Mergansers, Loons, Terns, Puffins, Osprey, Cormorant, Seals, Moose, Deer… we recommend you bring your camera as well as your gun! Professional guiding is our business and taking you on a safe and successful sea duck hunt is our goal. At day’s end, however, our greatest personal satisfaction comes from knowing you will leave with far more than you came for.